The National Anthem. It’s a song we learn the words to as elementary students and it is one of the few that we sing (or at least hear) throughout our entire lives. It is a song sung before sporting events large and small, graduations, when we are recognizing veterans or members of our military and before important political events. When athletes hear their national anthem sung at the Olympics or during the World Cup, they often are brought to tears. Every country’s national anthem is a great source of pride for its citizens. 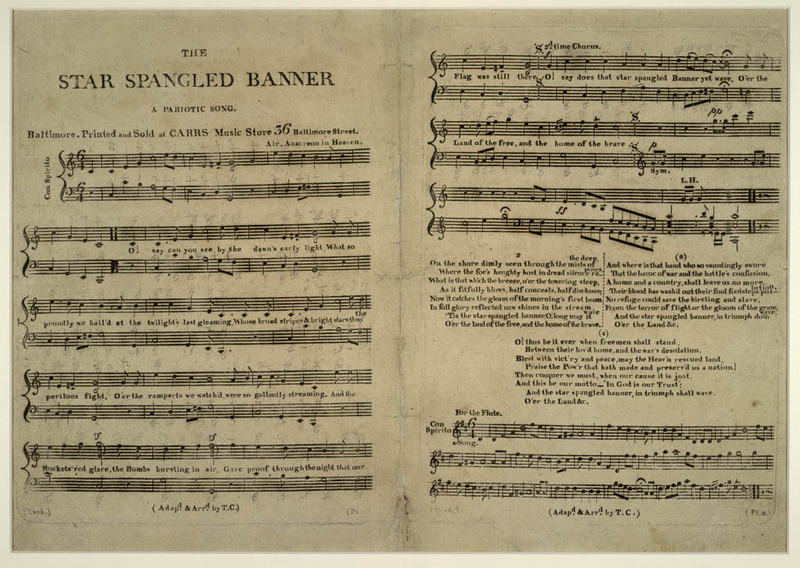 The Star-Spangled Banner was originally just a poem titled “Defence of Fort M’Henry” written by Francis Scott Key during the War of 1812 as he watched the British bombard Fort McHenry. The story goes that in the morning, he could see the American flag still waving above the fort and was inspired to write the poem whose first verse is known as the national anthem of the United States. The poem was adopted as the U.S. National Anthem in 1931 by congressional resolution and was signed by President Herbert Hoover. There are two things that strike me as particularly intriguing about the Star-Spangled Banner. First, I have always found it comical, coincidental and perhaps ironic that the poem was set to the tune of the theme song of the Anacreontic Society for British musicians because it was also sort of known as a drinking song. It seems our ancestors had a sense of humor and this situation has always suggested (at least to me) that they were mocking the British in some way. I have also heard that someone close to Key noticed that the meter of his poem resembled the song and put the lyrics to the score of “To Anacreon in Heaven.” Check out this recording of “To Anacreon in Heaven” if you’re curious to hear the original source of inspiration. Secondly, the song that we sing today ends after the first stanza. We have to do this, because otherwise our anthem would probably be 20 minutes long. But, the place where the song breaks off leaves our anthem to end in a question: “O say, does that star-spangled banner yet wave/Oe’r the land of the free, and the home of the brave?” If you look at it in print, you will see the question mark in its proper place, but nothing about our voice inflection when we sing the song suggests that there is a question being asked. The question mark in our national anthem has always been intriguing to me because it suggests that the song does not end on a strong note. Of course, if we sang the song all the way through as it was intended, this issue is eliminated. Supposedly the United States is one of the strongest nations in the world. And yet, our existence and our stance as professed in the realm of anthems suggest a transience or a questionable standing, simply by the cutting off of the song at the question mark. But this is just me being a literature/grammar nerd. When I go to Chiefs games with my mom, we stand there together, our hands on our hearts decked out in our red shirts. Around us are tens of thousands of other people all screaming and shouting, most of them being obnoxious. Many of these people are Chiefs fans. Many of them are not. But, no matter their allegiance in the NFL, for one moment, we are all united beneath this red, white and blue emblem and this song that reminds us of our shared heritage. Everyone is silent (for the most part) and all eyes are turned on the lone person standing in the middle of the field. And though that person is small and I can barely make out their features from my seat, the singer’s voice resounds around the stadium and reminds me that I am lucky and free to be the woman who I choose. As the singer’s voice dies away, the echoes recede and the crowd gets back to their shouting and jeering, planes buzz overhead and I turn my head towards them. I know exactly where to look because my mom and I have been coming to games since I was a small child. But as I’ve grown, I’ve learned to also watch my mom out of the corner of my eye because I know that every time she will reach her arms up towards those planes as they fly above us. I don’t really know what she is thinking at that moment. But in her gesture, I see all of her feelings of gratitude, her spirit flying high with the planes that symbolize the people who protect us and the innovative, questing nature of the people of this country and lastly her, sheer, unbridled joy. And it is in this moment, my heart swells and soars with her.